keedagiri: Where there is a WILL, there is a way! Does the absence of something can be considered as a definitive input? 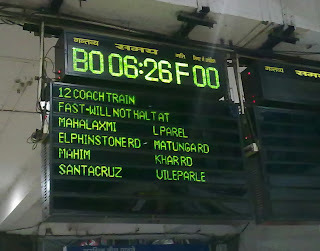 In simpler terms, if you DONT see one station name on the board, does that mean that the train WILL stop there? It's a WRONG* way of displaying information since you are forced to take decisions by the absence of information. In this case, if YOU dont see a station name, you are FORCED to make a conclusion that the train will stop at that station, despite the fact that may be you just missed the name which was already there. I believe it should be the other way round where they display the stations in which the train stops. And once you SEE the name, you're sure that it WILL stop there. *one friend of mine had a heated discussion with me arguing that the people who come to mumbai (not the ones who are already livini here) are more worried about the stations at which it doesnt stop. But let me tell you. Irrespective of mumbai or bangalore, the question is whether you should take decisions by the absence of information. Period.